Michael Broek is the author of Refuge/es, winner of the Kinereth Gensler Award for poetry, forthcoming in 2015 from Alice James Books, and two chapbooks, The Logic of Yoo, from Beloit Poetry Journal, which has been adapted to a staged reading, and The Amputation Artist, from ELJ Publications. His poetry and essays have appeared widely in places such as The American Poetry Review, The Literary Review, Drunken Boat, Literary Imagination, Blackbird, Fourteen Hills, and others. He has been a New Jersey State Arts Council Fellow in Poetry and Bread Loaf Writers Conference Returning Contributor Scholar. He edits the journal Tran(s)tudies and is managing editor of Mead: the Magazine of Literature and Libations. 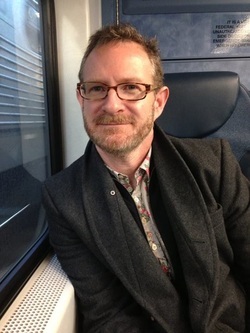 He holds an MFA in Poetry from Goddard College and a PhD in American Literature from Essex University, UK. He lives and teaches in New Jersey. For more information about Michael, please visit his author website here.